Tip the flour into a warm large bowl with the salt and dried yeast. (If using fresh yeast mix into the warm water.) Pour the warm water, milk and oil into the flour and stir until all the ingredients come together. Divide the dough into four equal pieces and roll or stretch the pizza dough to a disc approx 25cm in diameter and place on a lightly oiled baking sheet. Leave in a warm place for about 15-30 minutes. If you want to freeze any bases now slide them into the freezer on trays. Then take off the trays when hard (about 2 hours) and store in freezer bags. To cook straight away: Preheat the oven to 220C (425F) mark 7. 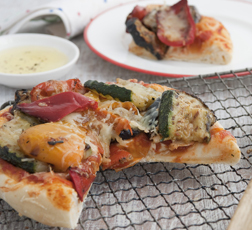 Delicious pizza combinations using frozen vegetables;Frozen Spinach – defrost and scatter over with chopped tomatoes, top with grated cheese, goats cheese, ricotta or mozzarella works well and crack an egg in the middle if you like. Cooks tipIt’s not always necessary to smear pizza with tomato sauce, try adding chopped fresh tomatoes or just use a can of chopped tomatoes for ease.Pizza dough is dead simple to make, there is no reason to be wary of yeast, which comes in packets and just gets on with the job once made active by liquid and warmth.If you have one, use a bread making machine or mixer with dough hook, it does all the hard work for you.If you are really short on time you could buy pizza bases and add your own leftover toppings.For an instant ‘woodfired’ type pizza roll out the dough thinly and cook on a smoking hot griddle one side, flip and smear with tomato sauce and toppings and grill until bubbling.